Q1: What makes SFKB different? Q3: Do you provide free estimates? Q4: How long does it take to get an estimate and draft drawings? Q5: What to look for when comparing estimates? Q6: Why are custom cabinets more expensive? Q7: What are the benefits of purchasing cabinetry and millwork from SFKB? Q8: Is there an insentive to purchase both cabinets and millwork from SFKB? Q9: Do you have a showroom? Q10: What species of wood do you offer? Q11: What is the current trend for wood species? Q12: Why do you need appliance specifications? Q13: Why do you need to know flooring information? Q14: Why do you need to know ceiling heights? Q15: Where can we view hardware selections? Q16: Why do you oversize your laminate countertops? Q17: Do you sell closet organizing systems? Q20: Do you build custom furniture? Q21: From the time an order is place how long does it take to get cabinets? Q22: What are blumotion drawer guides? A1: What makes SFKB different? There are several things that separate SFKB from other cabinet shops. First of all our cabinets are custom made to meet the needs of our customers not mass produced to meet ours. Our cabinets are made by woodworkers who take pride in their craftsmanship and genuinely enjoy what they do. It is because of this craftsmanship and attention to detail that our cabinetry is of the highest QUALITY and durability. Second it is the goal of our designers to create an open line of communication to the point where our customers feel comfortable asking any and all questions they may have. It is our hope that through this communication we can equip our customers with the knowledge they need to make informed decisions. 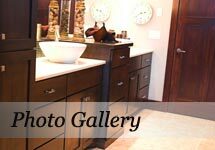 If we have thoroughly educated our customers we are confident that the VALUE of our cabinetry will be apparent. Lastly we place an emphasis on CUSTOMER SERVICE. We believe customer service starts when the initial contact is made with a potential customer and in essence never ends. We do not have the mentality that once the cabinets have left our facility that we are done (out of sight out of mind). But rather we feel our customer service must continue long after the cabinetry has been installed. Much of our business is based on referrals and repeat customers so we truly understand that the future of our business is rooted in the satisfaction of our customers. QUALITY, VALUE and CUSTOMER SERVICE is the SFKB difference.